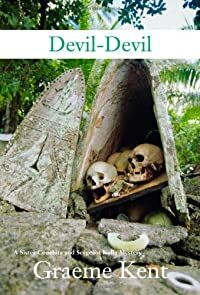 Devil-Devil by Graeme Kent, a Mysterious Review. Review: Ben Kella — an internationally educated police sergeant for the British government which administers the Solomon Islands in 1960, where the book is set, but also an aofia, a hereditary peacekeeper for his people — and Sister Conchita, a nun with a local mission, work together to investigate a series of disparate events that may be connected with the disappearance of a professor in Devil-Devil, the first mystery in this series by Graeme Kent. [Y]ou flagrantly disobeyed these instructions. On your own initiative you start an investigation into the custom killing of a villager. Then you discover a skeleton at a mission station and allege that it is that of a beachcomber who has been murdered. After that you become involved in a shooting incident with a Roman Catholic sister, and tell her that someone is trying to kill her. Finally you launch yourself on an expedition into the most dangerous area of Malaita. This time you encounter the corpse of a dead schoolboy. This drives you into a rage, which antagonizes the local people to such an extent that they were about to kill you when Inspector Lorrimer and his officers arrived providentially. "The mission is where all the trouble started." "I just do," said Kella. He paused and then added reluctantly, "The spirits told me so." "Oh, fine!" burst out Sister Conchita. "I'm dragged down a river and across a marsh because, I'm informed — me, a Christian sister, mind you — you're getting messages across the ether from trolls?" "This is my island and they're my spirits," said Kella. The unusual setting in the Solomon Islands enhances the overall appeal of the story, with its mountains and rain forests and artificial islands constructed by hand in the lagoon adding to the mystique surrounding the otherwise unexplained — or more aptly, yet to be explained — events. Devil-Devil is an extraordinary novel, one of the year's best mysteries, and one not to be missed. Acknowledgment: Soho Press provided an ARC of Devil-Devil for this review.